What are Articulating Keyboard Arms? Articulating Keyboard Arms are simply mechanisms that can adjust the height and position of a Keyboard Tray to an ergonomic height and location for the user. Superior models allow for features such as storability (when the tray is not in use), adjustable tilt (to provide a negative inclination to the tray), and extraordinary height range (for users desiring a sit stand solution). There are two general categories of articulating keyboard arms which are defined by the type of storage track used; glide and ball bearing. Glide Tracks feature plastic 'glides' that with the help of a dry grease lubricant move along the metal track when the user pulls out or stores the Keyboard Tray. Note: The dry grease will over time require re-application to prevent grinding and wear or damage to the plastic glides. Ball Bearing Tracks are composed of hundreds of small ball bearings which allow the user to 'roll' the arm out and back without the need for any maintenance through the life of the product. Keyboard Trays are simply a small work surface which can be affixed to a keyboard arm to provide an area to use the keyboard and mouse. Some designs feature a separate mousing area which can swing out or swivel out (which requires moving the mouse somewhere each time you store it). More durable and stable designs feature one solid piece which provides sufficient real estate for both the keyboard and mouse. Keyboard Trays are typically composed of ABS Plastic (more flexible, less prone to breakage with impact) or Phenolic (more rigid, less likely to flex from the central arm support). What are the Ergonomic Benefits of an Articulating Keyboard Arm and Keyboard Tray? Articulating Keyboard Arms allow the user to adjust the height of their Keyboard Tray to the optimal position which is just above the thighs of the user. This should result in the wrists of the user being slightly lower than the elbows, and in no cases higher than the the elbows of the user. Articulating Keyboard Arms also allow the user to bring the Keyboard Tray very close to the body of the user to allow the arms above the elbows to remain parallel to the body when keyboarding and mousing. Finally, superior models allow for negative inclination of the Keyboard Tray which can assist in addressing Positively Inclined input devices. What are Potential Concerns when Considering an Articulating Keyboard Arm and Keyboard Tray? The first concern is whether there is sufficient space under the desk to mount and store an Articulating Keyboard Arm and Keyboard Tray. Typically one should have at least 1" of space on either side of the Keyboard Tray to prevent accidental pinching of fingers / clothing while storing the tray under the desk. The desk itself must be composed of a material that can support the Articulating Keyboard Arm and the weight which will be applied to it. If the desk is made of particle board or is not particularly strong, an additional sheet of plywood may be required (affixed with a large number of shallow screws) to provide a suitable mounting location for the Arm. Once these procedural requirements are addressed, the next concern is to determine the range of movement required to provide the ergonomic benefits desired. If the arm doesn't extend out far enough, a Corner Converter may be required which allows the arm to be mounted at a 45° angle coming out of the corner of an 'L' shaped desk. The Articulating Keyboard Arm should adjust low enough to be below the height of the elbows when comfortably seated. 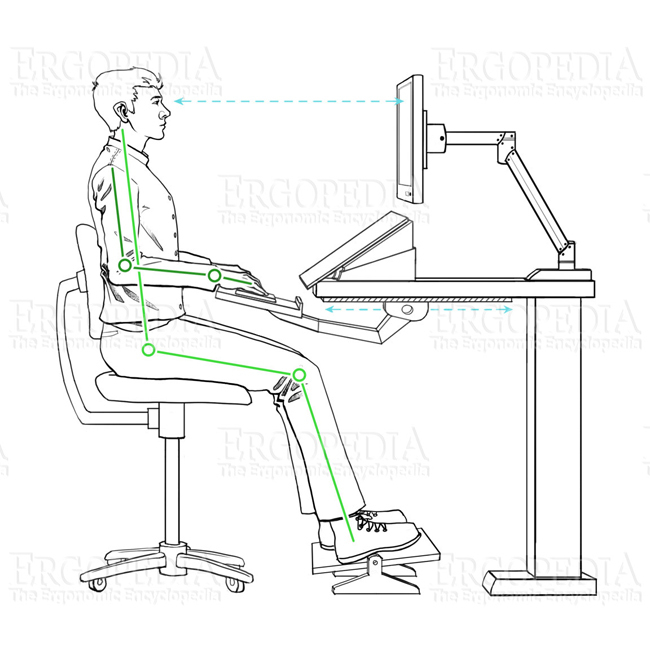 If this is a sit-stand application, then for standing applications it should be capable of getting to within 2" below the elbows when the user is standing. The Keyboard Tray must be large enough to accommodate not only the keyboard of the user, but also to provide a suitable Mousing Area for the user. A user with a conventional keyboard (18" wide) and mouse (6" minimum width) would therefore require a 24" tray, and would likely be better served with a wider tray. For what Types of Tasks / Users are Articulating Keyboard Arms and Keyboard Trays Suitable? Articulating Keyboard Arms and Keyboard Trays are well suited to any users who have a work surface that is higher than their elbows and cannot raise their chair to make the desktop the appropriate relative height. They are also suited to users who seek a sit-stand solution and do not have a desk which is itself height adjustable. What Physical Injuries or Conditions Typically Benefit from an Articulating Keyboard Arm and Keyboard Tray? Individuals who have pain in their hands, wrists, arms and shoulders will see immediate benefits from working on a work surface at the appropriate height. Injuries such as Carpal Tunnel Syndrome, Guyon's Canal Syndrome and Lateral Epicondylitis can become aggravated as pressure from the edge of a desk will be felt on the underside of the wrist if the work surface is too high.